The biggest agricultural story in South Africa in the last week of January 2018 was the release of the preliminary summer crop planting estimates. This is an important data print. It signals the potential size of South Africa’s grains and oilseeds production for a particular season and therefore has a direct impact on all South Africans in terms of our national food supplies. Summer crops in this context refer to yellow maize, white maize, sunflower seed, soybeans, groundnuts (peanuts), sorghum and dry beans. The preliminary estimates showed that the overall area planted with summer crops declined by 7% year-on-year in the 2017/18 production season to 3.70 million hectares. However, a closer look shows that the picture is somewhat mixed as the 2017/18 summer crop production season experienced erratic weather conditions. The eastern parts of the country received a fair amount of rainfall, which is good for crops such as yellow maize and soybeans that are predominantly planted in the region. Meanwhile, the central and western parts of South Africa received very little rainfall in the final few weeks of 2017, and also had a drier start to 2018, thus negatively affecting crops such as white maize and sunflower seed in this particular region. The National Crop Estimates Committee’s preliminary plantings data mirrored this variation in weather patterns by showing a decline in hectares planted in almost all crops in the western parts of the country. 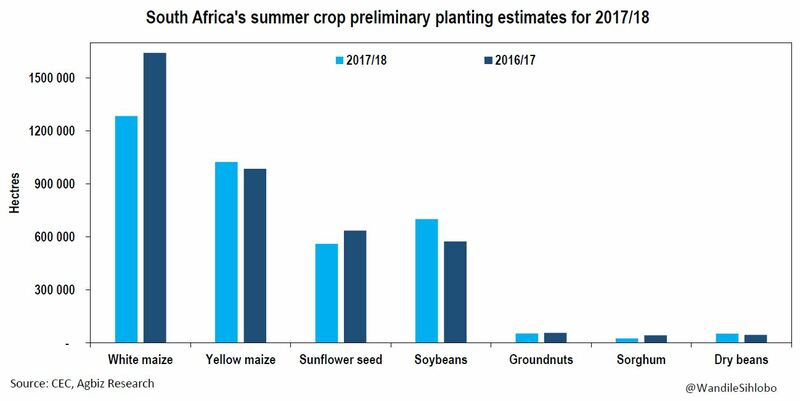 Most notably, white maize and sunflower seed hectares declined by 22% and 12% from the 2016/17 production season to 1.3 million hectares and 560 100 hectares, respectively. Whereas, crops planted in the eastern regions of South Africa showed an increase in hectares. The most notable crops were yellow maize and soybean area plantings which increased by 4% and 22% from the 2016/17 production season to 1.0 million hectares and 701 000 hectares, respectively. Overall, these developments show that staple crops such as maize could decline significantly from the record harvest of 16.7 million tonnes in the 2016/17 production season. In fact, our initial estimates at the Agricultural Business Chamber suggest that 2017/18 total maize production could decline to 11.2 million tonnes. While this is an immediate concern for farming communities, the outlook for food inflation will not change significantly in the near to medium term due to the buffer of large stocks totalling over 4.1 million tonnes from the 2016/17 production season, as well as the fact that the estimated 11.2 million tonnes (coupled with stocks of over 4.1 million tonnes) are well above South Africa’s annual maize needs of 10.5 million tonnes. Going forward though, the weather will be a key factor to monitor throughout the production period as it will have notable implication on crop development. Fortunately, the South African Weather Service forecasts above-normal rainfall between this month and April 2018 over the summer rainfall areas, which bodes well for crops.